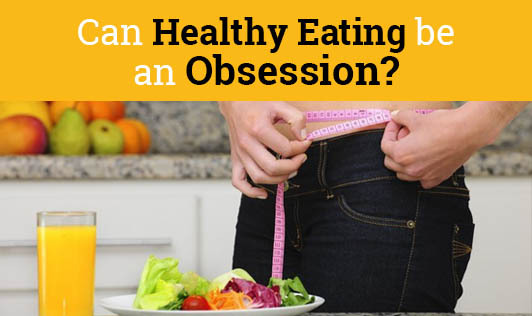 Can Healthy Eating be an Obsession? Gone are the days when we used to eat roasted groundnuts or popcorn or upma or poha at home as an evening snack. Kids of this generation prefer eating burgers and pastries instead. So as a Nutritionist, I always urge people to eat healthy and choose homemade foods. But off late, I am coming across people who have become obsessed with healthy eating and coincidentally, I have a few such people even in my family! Yes, when you over think about healthy eating it turns to obsession and Mr. Steven Bratman has coined a term for the same, "Orthorexia". • Do you think about healthy diet for more than 3 hours a day? • Are you planning your tomorrow's diet today? • Do you give more importance to the nutrients in the food than the pleasure of eating that food? • Do you think the quality of your life has reduced after increasing the quality of your diet? • Are you strict with yourself off late? • Has healthy eating boosted your self esteem? • Have you given up foods that you used to enjoy for the sake of healthy eating? • Have you stopped eating out with your family or friends thinking it isn't healthy?? • Do you feel guilty when you deviate from your healthy eating? • Do you feel you are ‘in control' when you eat healthy? And now the results: If you say yes for 4 or more of the above questions, you may have Orthorexia. Bratman says, "Loosen the grip" and relax. He says that it is important to eat healthy, but it is also important to have spontaneity and enjoyment in life. It goes without saying that people who continue with their unhealthy eating practices after reading, it is time you understand ‘moderation is the key'. For all of you who think rice is fattening, banana is a big NO for weight loss or paneer increases your weight etc..., time you talk to your Dietician!